Unlock complex puzzles to solve a mystery of murderous proportions. "I like Agatha Christie books so I thought this was very interesting. Personally, I think it is the perfect level of difficulty; I can play quickly without frustration, but it's not so easy I get bored. I thought the graphics were excellent, and I finished it in two evenings." Fans of classic mystery stories and great Hidden Object games alike, rejoice. Hercule Poirot is at it again - Mon dieu - in another mystery of murderous proportions. 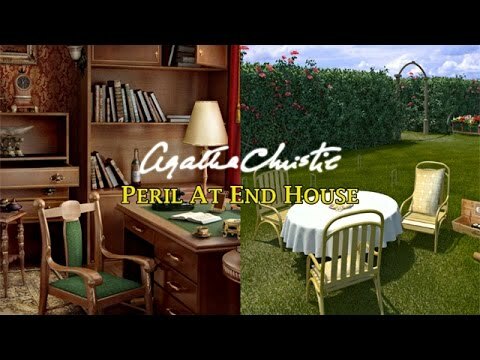 Second in the Agatha Christie series, Peril at End House stays true to the classic Agatha Christie mystery and offers a challenging take on the popular genre. Find clues, uncover evidence and unlock complex puzzles to take one step closer to solving the mystery. Following in the footsteps of Agatha Christie: Death on the Nile, Peril at End House is sure to keep you coming back for more. Great Agatha Christie novel -- read the book and thoroughly enjoyed it. Please come out with more games of similar genres like this one. Another Agatha Christie success! I enjoy finding hidden objects that are small and not immediately obvious. In other games, I have found the objects to be indistinct but in the Agatha games, they have good detail so that once you find it, you know immediately what it is. I purchased this one and hope there are more to come. I enjoy this game because the graphics are above standard. I like the difficulty of the different levels -- some are very difficult. Moving through the game is challenging, but fun. This game is exciting. I love Agatha Christie games. A hard game to play but that is the thrill of it. Just love this game. Makes me think and use my eyes. Helps in keeping me alert and actively sharpens the mind. This game was challenging, but not so hard that you had to keep your hand on the hint button. I thoroughly enjoyed this game.